There used to be a time when there was a strong line drawn between teacher and student. The teacher taught, the student learned. And if there were any problems, miscommunications, or learning difficulties, that was too bad. The student had to learn, period. These days we live in a culture that takes the whole teacher/student connection a lot more seriously. Students aren’t just numbers in a seat; they are impressionable, interactive people who could use a hand now and then getting through school. Teachers who foster positive relationships with their students create classroom environments more conducive to learning while meeting students’ developmental, emotional and academic needs. 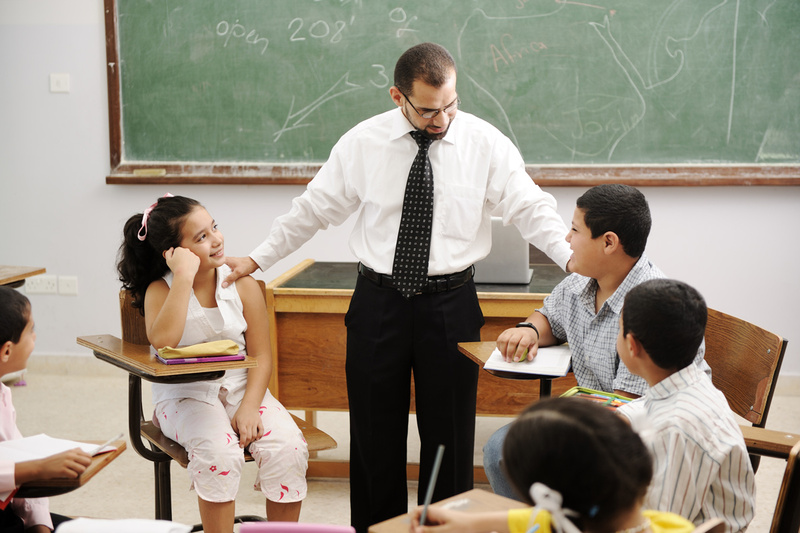 Positive teacher-student relationships — evidenced by teachers’ reports of low conflict, a high degree of closeness and support, and little dependency — have been shown to support students’ adjustment to school, contribute to their social skills, promote academic performance, and foster students’ resiliency in academic performance. Building a relationship with a student opens up a door for the student where it is safe to be themselves, void of outside conflicts. That space between a teacher and a student can be enough to strengthen a student’s confidence in both his school and home environments. Make an effort to get to know and connect with each student in your classroom. Always call them by their names, find out information about their interests and strive to understand what they need to succeed in school. Make an effort to spend time individually with each student, especially those who are difficult or shy. This will help you create a more positive relationship with them. Be aware of the explicit and implicit messages you are giving to your students. Be careful to show your students that you want them to do well in school through both actions and words. Create a positive climate in your classroom by focusing not only on improving your relationships with your students, but also on enhancing the relationships among your students. Be aware that you are modeling behavior for your students, whether intentional or not. Students notice your interaction style. They notice whether you show warmth and respect toward them, to other students and to adults at your school. Often, they will model their own behavior after your behavior. Students notice the methods you use to manage strong emotions. They notice positive strategies, such as taking a deep breath or talking about your frustrations. Likewise, they notice negative strategies, too, such as yelling at students or making mean or disrespectful jokes about colleagues. Be aware that students will often adopt the strategies that you use. Don’t assume that being kind and respectful to students is enough to bolster achievement. Ideal classrooms have more than a single goal: teachers hold students to appropriately high standards of academic performance and offer students an opportunity for an emotional connection to their teachers, their fellow students and the school. Don’t give up too quickly on your efforts to develop positive relationships with difficult students. These students will benefit from a good teacher-student relationship as much or more than their easier-to-get-along-with peers. Don’t assume that respectful and sensitive interactions are only important to elementary school students. Middle and high school students benefit from such relationships as well. Don’t assume that relationships are inconsequential. Some research suggests that preschool children who have a lot of conflict with their teachers show increases in stress hormones when they interact with these teachers. Don’t wait for negative behaviors and interactions to occur in the classroom. Instead, take a proactive stance on promoting a positive social experience by including students in discussions about pro-social interactions and consistently modeling those positive interactions for them. Are you giving students meaningful feedback that says you care about them and their learning, or are you constantly telling your students to hurry? In your conversations, are you focusing on what your students have accomplished or are you concentrating your comments on what they have not yet mastered? Do your body language, facial expression, and tone of voice show your students that you are interested in them as people too? Are you telling them to do one thing, yet you model quite different behavior? For example, are you telling your students to listen to each other, but then look bored when one of them talks to the class? Be sure that the feedback you give to your students conveys the message that you are supporting their learning and that you care about them. Are you paying more attention to some students than to others? The truth of the matter is that interacting and being sensitive to your student’s needs makes you feel good as well. There are pitfalls all through school, and students do need to learn from their experiences. But there is comfort in the fact that someone other than their family is there to listen when problems become too hard to handle all by themselves. Next Post Makerspace 4 — Where Do You Get Ideas?